For those of you fed up with recorders that could only burn content in standard 1080P HD, a change is coming! According to the Blu-ray Disc Association, the 4K UHD Blu-ray recordable format will be available in just over 2 short years from now. The initial launch will take place in Japan, to coincide with the 2020 Summer Olympics that will take place in Tokyo. This means that you can record 4K content directly onto Blu-ray media to preserve the most brilliant picture and sound available today. So set your calendars and let the countdown begin for the next wave of large capacity optical discs are ready to hit the market and take the world by storm! For more details about currently available Blu-ray recorders and media or any products that Vinpower offers, please visit, www.vinpowerdigital.com, or speak with a Vinpower representative in your region. 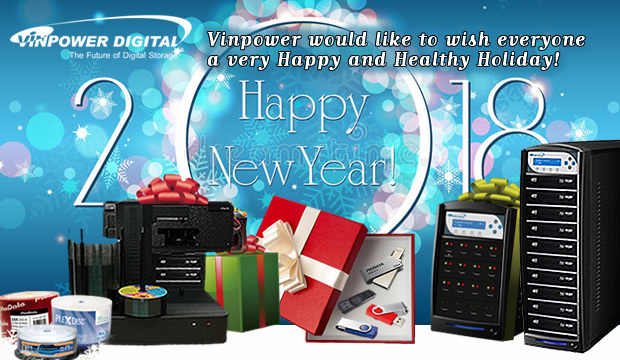 Vinpower would like to wish everyone a very Happy and Healthy Holiday! Regardless of which holiday(s) you celebrate, or possibly none at all, in the spirit of good will, Vinpower would like to wish everyone a very Happy Holidays and a Healthy and Prosperous New Year. Vinpower would like to thank everyone that helped contribute to the success of 2017 for us and those we work with. Without the support of our customers, vendors, and friends, we would never have achieved the good fortunes weâ€™ve experienced this past year. Thank you for everything and hereâ€™s to an even greater 2018! The start of a new calendar year symbolizes the rebirth, especially for the electronics Industry with the arrival of CES (Consumer Electronic Show), taking place in Las Vegas, NV from Tuesday, January 9 through Friday, January 12, 2018. 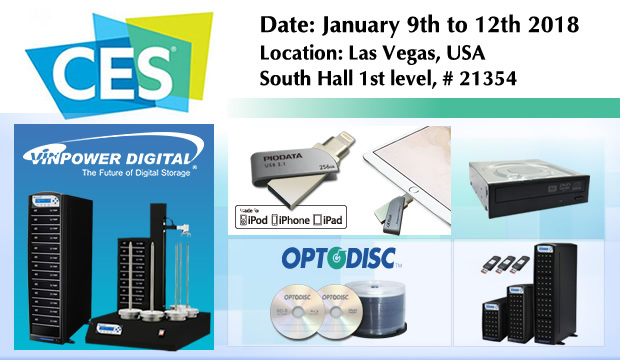 Once again, Vinpower will be exhibiting at CES in the South Hall 1st level, space # 21354. We will be exhibiting some exciting new product lines that we have recently finalized. However, in order to be among the first to witness these incredible new products, youâ€™ll have to visit us at CES and see them for yourself. Vinpower is very excited about these new offerings and think they will be very popular. Therefore, if you plan to attend the show, please contact us to make an appointment to visit our booth. If you cannot make it, stay tuned for future announcements from Vinpower! If you are unable to join us at CES next month, in 2018, we will also exhibit at the NAB trade show in April and the Computex trade show in June, amongst others. We look forward to meeting with everyone. Vinpowerâ€™s lines of ODD writer drives offer an Adaptive Recording Surface Sensitivity Application to ensure a smooth even stable burn across the full disc. When burning discs for duplication, itâ€™s not uncommon to find the recorded discs have a series of slight uneven concentric ring patterns across the burned side of the disc. This imperfection make the discs look as if they are defective and provide a negative appearance to the customer/recipient. 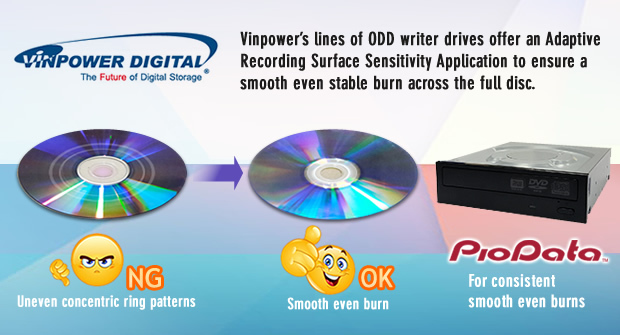 Vinpower recognizes that these unsightly burn marks can cause trouble for the duplicator and has worked diligently to develop a series of optical disc drives (ODD) that prevent these blemishes from occurring, providing a smooth consistent burn that is more reliable and professional. While maintaining precision-accuracy during the writing performance, Vinpowerâ€™s lines of ODDâ€™s carry the Adaptive Recording Surface Sensitivity Application to help prevent the uneven appearance on the recording surface of the discs. High quality duplication should leave the recordable side of a disc smooth and seamless for the most part. So when you can clearly see light and dark rings, that means the driveâ€™s laser would burn harder/more intense and lighter/less intense due to constant stopping and starting. Thatâ€™s where Vinpower Digital can help. As the only duplication hardware supplier that provides our own proprietary Optical Disc Drives (ODD), we fine tune our drives to have the best compatibility with a wide range of media offerings to provide the best quality seamless burns.